Vaunn Medical Pedal Exerciser Review - Includes Video! There are a few different types of pedal exercises we can choose from, high resistance exercisers, primarily built to help people burn calories and tone leg or arm muscles, and low resistance pedal exercisers. Low resistance exercisers are normally best suited for seniors, beginners, and people recovering for surgery. The Vaunn Medical Pedal Exerciser is an example of a low resistance pedal exercise, Vaunn has purposely designed this mini pedal exerciser to provide a gentle low impact workout that will help with blood circulation and muscle toning during physiotherapy. If you were hoping to lose some calories exercising on the Vaunn bike don’t fear you probably will, the bike does include a resistance setting to change the difficulty of your workout, obviously the harder the resistance setting the more effort needed, and more calories burned. If burning calories is your main goal, there are many other high resistance mini bikes that are better suited to the job, a good cheap all-rounder is the Vivi Pedal Exerciser a mini bike that caters for both advanced and beginners needs. The main purpose of the Vaunn Mini Exerciser is to help recovery patients and seniors who need a low impact piece of exercise equipment they can use from the comfort of their armchairs at home. At 4.4lb this mini exerciser is light, is that a good thing? Yes, for many of you it will be a plus point, being light will make the Vaunn very easy to carry around the house to different rooms. If we compare the Vaunn’s weight to a traditional upright exercise bike which can weigh anything from 30-100lb, you start to realize just how light and versatile this mini bike from Vaunn really is. There is however always a downside to a light piece of fitness equipment that uses the floor to stabilize itself, and this rather large downside is stability. With lightness, you will nearly always encounter stability problems, and when it comes to a mini bike, their main stability issues are toppling over when in use, and sliding. Vaunn have gone a long way trying to conquer this issue, their engineers decided rather than using three pieces of steel for the main steel frame they would just use a singular piece of heavy-duty steel, this they believe has helped considerably with any wobble or chances of toppling when in use. And lastly, they added non-skid ribbed rubber platform and reinforced rubber feet which help to stop this thing sliding around on table tops and hard floors. It’s great to see that Vaunn has made a real effort to try and make the pedal exerciser as stable as possible, for a bike this light Vaunn’s offering is probably one of the most stable on the market. Every company who builds a mini bike will usually try to make their product as low profile as possible, why? Because then it can be sold as a desk cycle too, although the Vaunn bike isn’t branded as a desk cycle they do advertise as being low profile enough for desk use. Although most who buy this cycle will be using it for home use, there will be others out there looking at Vaunn hoping it can be used at work or whilst on the Pc at home etc. The lowest point your foot is off the floor when using the Vaunn cycle is 5.5″ and highest is 12.5″ which isn’t super low but it should let the Vaunn fit under most desks. Of course, whether it suits you depends on how tall you are and the height of your desk. The Vaunn bike lacks its own little onboard computer with LCD display, these can be handy for keeping count of calories burnt, time spent on machine etc, but not having one does bring costs down slightly. If you’re not too interested in how many calories you’re burning and your RPM, going without one of these and saving a few bucks might prove to be a good option. Always good to see on any mini pedal bike is a resistance setting, great for beginners who need to start off on the lowest resistance possible. What a tension knob allows you to do, is increase the resistance as you progress in your training. But we need to remember as it’s a physical therapy device first and foremost, it doesn’t offer much in the way of resistance and you shouldn’t use it as a regular workout machine, there is too little resistance for advanced users. For the price, it does the job it’s designed for very well, Vaunn’s mini bike has become a popular choice which consistently receives high ratings from hundreds of reviews. It seems Vaunn have produced a pedal exerciser people find to be very beneficial to their everyday lives, a capable, affordable option that does without the frills of the higher priced mini bikes. 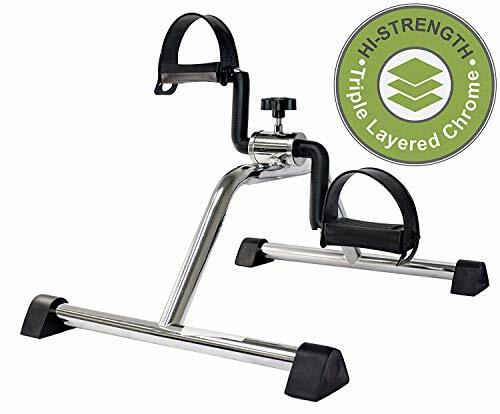 Overall an excellent pedal exerciser for seniors, recovery patients, and beginners, the lightweight design certainly will appeal to those who need a light piece of equipment to move and store easily. If you're happy to live without the calorie counting LCD screen, then this very affordable, stable option from Vaunn should prove to be a worthwhile buy.